The days when two comets are visible in the evening sky are approaching. I will talk about three rare books of mine, which are no longer sold. These books in the photograph below are from right Let's Discover New Astronomical Objects published by Iwanami Shoten Publishers, The Hunter of the Starry Sky from Chikuma Shobo, and The Hunter of the Stars from Akane Shobo. These are all non-fictions except for The Hunter of the Stars , which is partly fictional. At the beginning of the story, a man is exploring a mysterious cave at Cape Ashizuri in Shikoku and finds an old nautical chart at a sandy area. There is a drawing of a comet of the Kreutz group on that chart, which leads to the discovery of Comet Ikeya-Seki 100 years later. This is the plot of the story and I like it best of all myself. The Hunter of the Starry Sky was written for junior high school students and part of it is still being used in a school textbook in Aichi Prefecture. 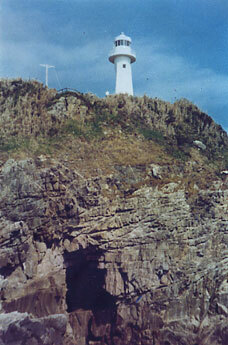 The cave under the lighthouse at Cape Ashizuri is very deep and sea water that runs into it is believed to have left a lot of drifting objects accumulating there. The place have been suspected to be used as a cache for pirates' treasures in the 17-18th century. Deep in the cave there was a frightful but subtle and profound world not known to the outside world. I will write about this in my "New Non-fiction Theater (a provisional title)" someday. The low-altitude sky below 10°is not visible from Geisei because of the forest in the east. Although I persisted until 4.30 in the morning, I was not able to see LINEAR (C/2002 T7) in the pale white eastern sky behind the forest. About 30 years ago Comet West rose through the same forest in early March in 1970. It was an awesome sight with the whole of the forest looking enveloped in the comet's gigantic flame and it could have been mistaken for the approach of twilight. Small LINEAR is no match for the great comet West. The comet was not visible but the Milky Way lying in the southern sky soothed my exhausted mind after the all night observation. Geisei sky still shows the magnificent Milky Way like this! In old days, weathermen learned the constellations to know the conditions of the sky by the appearance of the stars. Particularly, the forecasters in the battle fields needed to know the constellations to predict the next day's weather. Because the sky was very dark, they tried to check the conditions of the clouds from the way the constellations were visible. This practice seems to have continued for a while after the war. 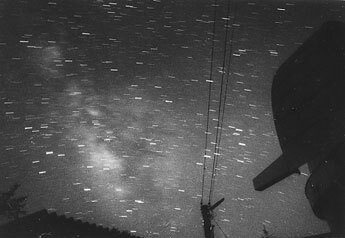 When Comet Wilson-Hubbard suddenly appeared in the predawn eastern sky in 1961, Mr. Hayashi at Choshi Regional Meteorological Station saw this comet first in Japan. For this he received a commendation from the Astronomical Society of Japan. 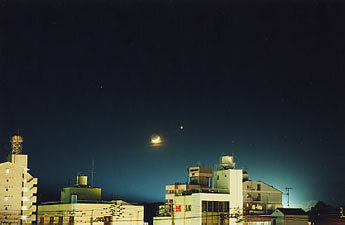 Mr. Hayashi was observing the conditions of the clouds in predawn skies everyday. I heard the beeps from the fax machine late at night. I wondered what it would be, though nothing was received. This morning's email stunned me. Bradfield's new comet appeared without warning. Any person of great stature, or a "sleeping lion", so to speak, dedicates themselves to the work they are committed to without a fanfare. Comet hunters who had gained a fame from earlier discoveries continue to devote themselves with a strong determination, though the public tends to think that a lack of discovery means a lack of serious efforts. In recent years LINEAR has discovered many comets while they were still at a great distance from the sun, though in earlier years they could have been visually discovered when they approached the sun. Some (defeated persons) alluded to this fact and said that there would be no future for amateurs. However, Bradfield's discovery has forced them to acknowledge that visual discoveries are still possible. Not a theory but effort leads to a discovery. The weather was not quite favorable, but, as rain was expected to start tomorrow, I came to the observatory. Although there were a lot of clouds, I shot two photographs of the predicted position of SL-569 (the 1569th discovery of a minor planet at Geisei) near Regulus in Leo. This object was discovered in February and its position was calculated by Mr. Masayuki Suzuki of Tochigi Prefecture based only on two photographs taken one night. Though a chance of its re-discovery was slim, I just wanted to make efforts regardless of the outcome. About one hour into observing, I saw a white glow approximately 30' across moving slowly to the southeast. It was moving in a direction totally different from the movement of clouds (northeast) that night. The lights of a plane were following the object from behind. I remembered IRAS-Araki-Alcock which appeared 20 years ago and wondered if the object could be a comet getting unusually close to the Earth. At 21.30 clouds increased and I was soon on my way home. 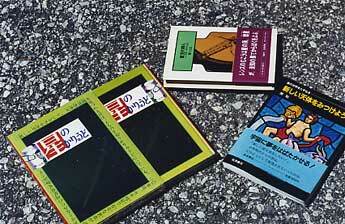 Copyright (C) 2004 Tsutomu Seki.